No matter how old you are, you have a legacy. A legacy is the culmination of the lives you have helped create, the people you have taught by your own example and the lessons you have learned and passed on. But those represent your external legacy – the things or people who are visible. What about your internal legacy? 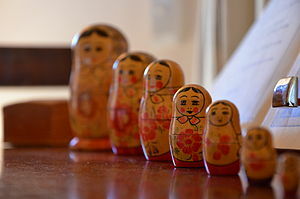 It is just like a nesting doll – what is on the outside is not necessarily the same as what is on the inside. When you carry stories about the past and apply them to the present, you are adding layers to yourself and your perspective. For example -When you see a family member and you instantly think of a past incident or a negative thought (“He is such a bum – he will never make anything of himself”) you are carrying emotional baggage about that person. What he did or didn’t do in the past is his business and his choice, not yours. What happens when you see that person again? Do you immediately think or say something related to the past? When that happens, are you living in the present moment or are you reliving the past, as you remember it and judged it? Your judgment about his choices keeps you tied to the past – he has probably moved on! Your judgments and thoughts about the past color your perception of the present moment. Think about how you would react to that same person if you did not instantly remember the past when you saw him. If your reaction is different, then you know you know the past is coloring your present perception. You can hold onto your past or you can learn from it. A scene from the Lion King brought that home to me. Simba has been in exile for many years and is finally discovered by Naila, his childhood friend and Rafiki, the witch doctor. When Simba refuses to return home because he thought he had killed his father, Rafiki hits him on the head with his cane. When Simba complains, Rafiki points out that being hit on the head was in the past, but you still feel the pain. You either continue to relive that moment, or you learn from it and move on. Fortunately, Simba got the message and moved on with his life, reclaimed his path and his destiny. What about you? Have you ever thought about changing your Story so your legacy is clear, sharp and well-defined? But how do you forgive? There are many books and people teaching how to forgive, but why not go to the source – look at how Jesus taught forgivenss and follow his example. When I was writing Walk With the Master, I imagined Jesus as he would have looked, walking the dusty streets of Nazareth. At the time of the story, he was about 20 years old – an adult in that culture – who had a presence and surety about him that was instantly recognizable. But more than his physical presence was his spiritual persona. When I tried to describe the impact he had on people, I realized that Jesus was the one person who ever walked the earth – who did not have any emotional baggage. He instantly forgave and never judged, and because he was God, God was always there to guide him. That is all we have to do…allow God into the relationship or situation and ask that he guide our thoughts, words and actions. Walk With the Master shows this process through the events in the story. The Faithful Companion Guide brings out the forgiveness lesson more clearly, and even sets out the steps to take. It is for anyone who wants to live a life free of their past stories. As you think about your legacy and look over your life, why not release those stories who are covering up the real you — it is never too late to uncover who you really are! « Is Your Life a Work of Art? LOVE the Lion King example! Haven’t seen the movie in years, but it fits perfect with the principle you are sharing. Thanks for a great read! Thanks for the comment – blessings! As I read these thought provoking words …I immediately started thinking of ALL the people I know who should read this!!! All the people who allow themselves to be unkind or unforgiving because of hurts they’ve had in the past …..THEN ..all of a sudden it hit me!!! THIS IS ABOUT ME TOO!! Ah .. God truly sends us those “zingers” just in the nick of time to keep us from straying too far off the path! Thanks for the terrific reminder! Well said. I have been working on a lesson for my Bible study class regarding forgiveness. I would like to quote you for a couple of illustrations, if that is OK with you. I will mention your blog as a reference. I would be honored if you shared anything you discover on my blog that resonates wiith you, as long as I am acknowledged as the author (I added this more to let other people know who might also want to share these words). There is a wonderful forgiveness story that is the centerpiece of my book, “Walk With the Master,” that you might want to look into. Grace – you are the author of your story. Why not make it great? Thank you for commenting – be well!